Find the best places to ride in Lyon for skateboard, BMX and roller! Are you a professional skateboarder, a local in search of new places to ride or a boardsports beginner? Lyon has always been one of the hottest urban sports destinations of the European scene and the city provides everything you’re looking for. Urban sports have grown exponentially over the past 30 years in France. City policies have followed up the trend of boardsports, such as rollerblading, skate-boarding, BMX or scootering, creating new spaces of expression in most French cities, including Lyon. 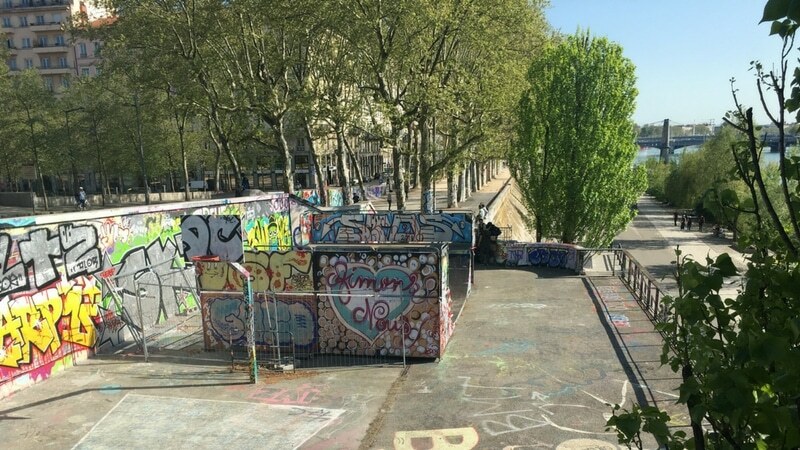 Skateparks are the iconic representation of boarding and gathering points for all lovers of urban sports, tight community between all the sports in Lyon. Lyon’s international outreach is tied to the city’s Hôtel de Ville. Not necessarily thanks to the city hall building, on Place des Terreaux, but rather because of the skateboarding spot on Place Louis Pradel, alongside the Opera. Baptised « HDV » (acronym for Hôtel de Ville), the spot has existed for nearly 30 years and continues to bring worldwide skateboarders to Lyon. A smooth but hard surface, concrete benches and a central pyramid for stunts: the plaza offers all a skateboarder could look for. The Hotel de Ville popularity grew in the 1990s with the exit of skateparks in favor of street skateboarding, to the point of turning the plaza into a mythical spot. The emergence of homemade videos (the name of film-maker Fred Mortagne resonates in Lyon) as well as the pool of skilled and local athletes, like JB Gillet or Jérémie Daclin, were other factors that brought Lyon to the skateboarding forefront. The presence of some of the world’s best skateboarders and the influence of local actors built Lyon as one of the world’s capitals of skateboarding ; or at least an underground destination that needs to be visited once in a lifetime. Unfortunately, the « HDV » spot is in jeopardy. 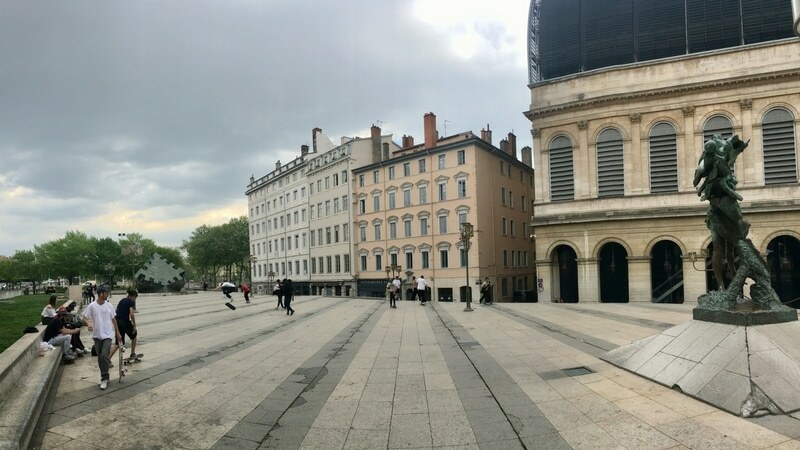 The deplorable state of the ground makes it really hard to ride and the city of Lyon has announced plans to renovate Place Louis Pradel, removing the skateboard-friendly urban properties. It might be in contradiction with the boardsports philosophy, which developed in the streets, but the Skatepark de Lyon has quickly become one of the largest and most important gathering places for urban sports in Lyon. The 1,500 square-meter indoor structure, inaugurated in 2000 in the sporting complex of Gerland in the 7th arrondissement, is open to every kind of urban rider (skateboards, rollers, scooters, BMX, etc.) all year long. A yearly subscription of 15€ and a fee of 3 to 5€ for each session is asked upon entry, but it does not stop the nearly 4,000 subscribers and 25,000 entries from filling the Skatepark de Lyon each year. 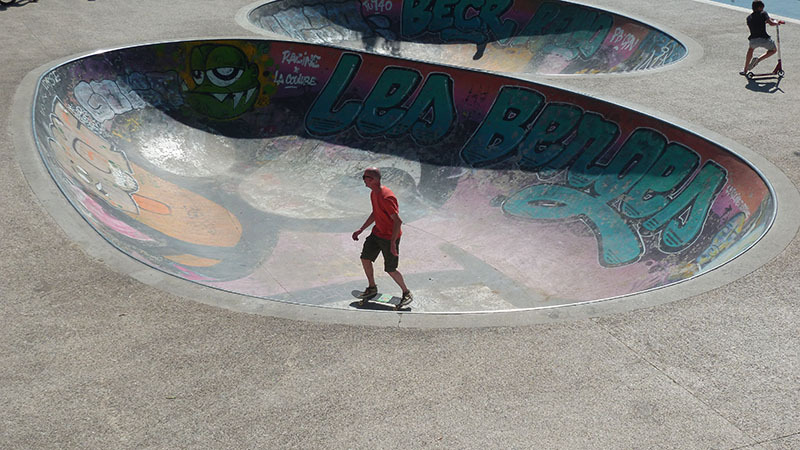 The Skatepark de Lyon offers three different areas, covered and secured, dedicated to the practice of urban sports : a bowl, an « airborne » area and a street area. It is open every day during holidays and from Tuesday to Sunday the rest of the time. Every type of boardsports are allowed during afternoon sessions (14h00-18h30 or 16h30-18h30), except BMX on Saturdays. However, evening sessions (19h00-22h00) are exclusive to BMX on Tuesdays, to rollers on Wednesdays and skateboards on Thursdays. Eager to learn how to skateboard or rollerblade? The Skatepark de Lyon created a skateboard school in 2005, followed by a rollerblading school in 2013, thanks to the efforts of motivated volunteers. Find more information on the Skatepark de Lyon website. Lyon became an unmissable urban boardsports destination over the years, not only thanks to the aura of the Hôtel de Ville or the Skatepark de Lyon, but also with the help of many other hotspots across town. The Rhône is the focus of the new generation of Lyon riders, especially since the riverside renovation completed in 2007. It led to the construction of the Bowl de la Guillotière, one of the most famous spots for skateboards, scooters, and BMX. The Bowl de la Guillotière stands today as one of the most iconic places to ride in Lyon. Even though the two bowls and street park are easily over-crowded, the Bowl de la Guillotière is a microcosm of urban culture, between artists, riders and the constant flow of bystanders walking along the riversides. Meanwhile, a little bit up the river stream at the crossing of Quai Augagneur and Pont Lafayette, the Square Jussieu (nicknamed « Petite Place » by locals) is quietly becoming a daily gathering point for skateboarding and BMX lovers. 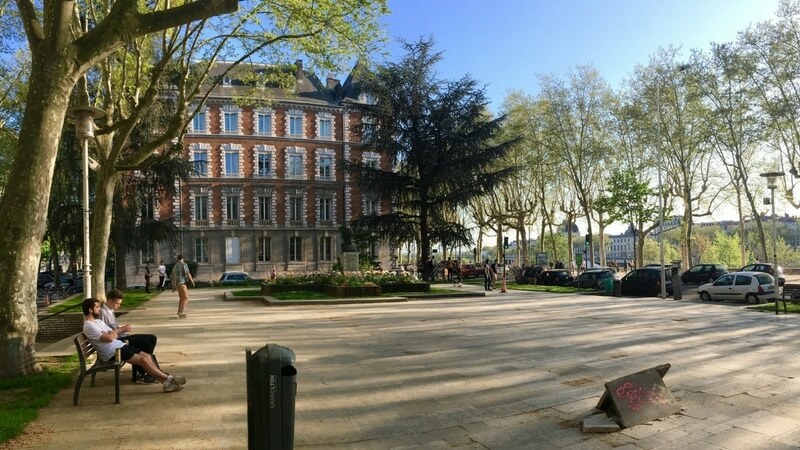 The flat square, furnished with the bust of Edouard Herriot, former mayor of Lyon, is today considered one of the city’s most iconic urban playgrounds. The cream of the crop of freestyle BMX riders and skateboarders reunite nearly every day to work on their tricks. Overhanging the street, the Square Jussieu stairs have been the scene of impressive jumps over the handrail, seen around the world and adding value to the urban boardsports reputation of Lyon. Further up the Rhône river at the intersection with Pont Morand, the Foch skatepark has been a hotspot of the skateboarding scene in Lyon probably as long as the Hôtel de Ville. The ramp and walls covered in graffiti reveal the full extent of the artistic footprint underlying Lyon’s sports culture. 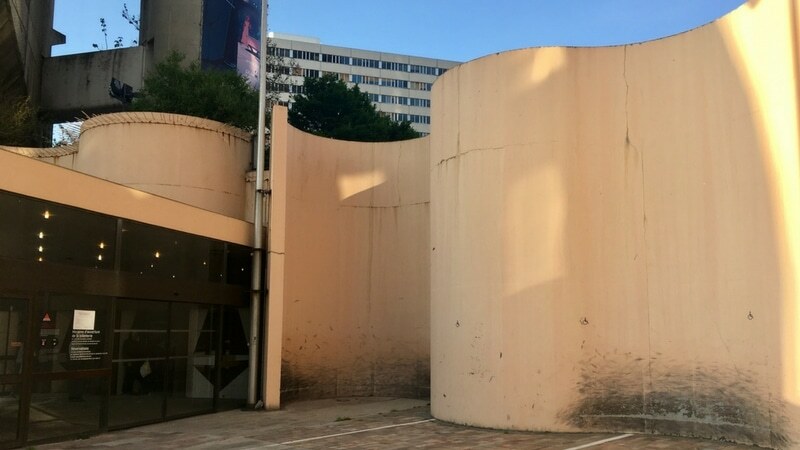 However, the aging and probably dangerous ramp has slowly been deserted in favor of other hotspots in Lyon, including the nearby Bowl de la Guillotière. Another ramp was recently placed beneath the old structure, along the walking path of the riversides. This one is relatively easy to tackle and its location makes it the perfect spot for beginner bike and scooter riders. The Presqu’île of Lyon always lacked of boardsports structures, especially if the « HDV » spot is removed from the equation. However, the drought has ended with the recent construction of the skatepark Roger Duplat. Inaugurated in November 2017, it provides a beautiful structure for beginners in every boardsport on the slopes of Croix-Rousse. Units painted in red are ideal for young skateboarders, bike or scooter riders living far from Lyon’s hotspots by the Rhône and Gerland. And it’s the same situation at the crossroads of the 3rd, 7th and 8th arrondissements. 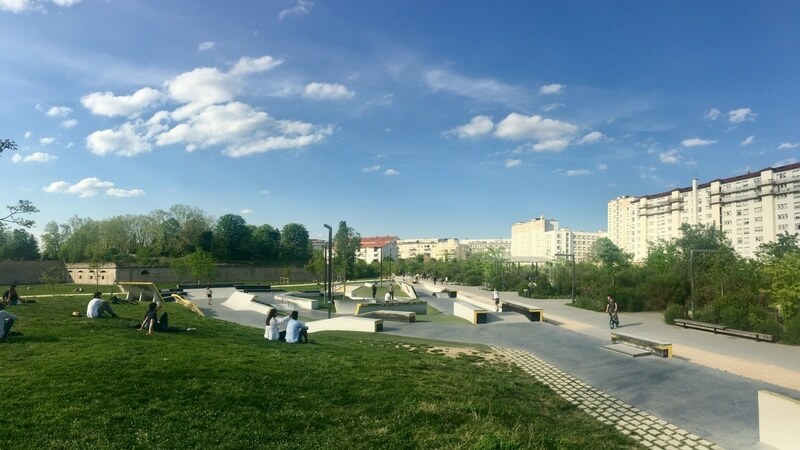 The Parc Sergent Blandan, which opened in 2014 in the place of an old military base, is equipped with a large skatepark that offers everything a rider would look for. Curbs, ledges, rails, wallrides and many more units are spread around the concrete skatepark, in the middle of one of the largest green parks in Lyon. It gives enough space and challenges for everyone looking to practice their skateboard, rollerblade or scooter skills with friends. Ask any skateboarder about the « Lyon 25 » and watch his reaction. If there is one, the 25 stairs of the Cité Internationale is the monster in Lyon. The professional riders that tamed this spot are counted on the fingers of one hand… and many others have run into trouble, figuratively and literally speaking. Aaron « Jaws » Omoki managed to jump over the 25 stairs in October 2015 after many failures and injuries. One of the most impressive skateboarding jumps ever pulled off in history, filmed by local film-maker Fred Mortagne, of course (successful jump at the 9:30 mark). The square in front of the Médiathèque de Bachut, in the 8th arrondissement, was not designed to become a street skateboarding spot. However, the urban properties present many « units » to ride and the many trees makes it a great place to film sessions. The skatepark of the Parc Marius Bourrat in Ste-Foy-lès-Lyon might be your favorite place to ride in the middle of a quiet green park. A flat area with some units sits next to the military base of Ste-Foy, in the bourgeois outskirts of Lyon. But what’s more unexpected than having a crazy wallride at the doorstep of the National Auditorium de Lyon? Famous BMX rider Kriss Kyle toured Europe in the search of the best wall rides and discovered this circular wallride in the 3rd arrondissement of Lyon. He eventually ended up doing a successful flip, and there is a video to prove it. Lyon offers plenty of ways to play the game.